We start with a 15 minute guided wine tour followed by a self-guided walk of 1.5 km through organic vineyards.On your return our guide provides an introduction to wine tasting with three wines the children can play an aroma game or colour our vine colouring-in sheets. This is followed by a five cheese platter with salad and a selection of breads, ideally matched with the wines. For the kids we serve crudites and plain cheeses and bread. Then a finale of coffee and chocolate while the children are offered ice-cream sticks.We can provide vegetarian friendly pairings and can cater to special needs like gluten free - please advise us in advance. All our wines are vegan friendly. Half price for children under 16. Possibility of a second self-guided loop after lunch. Minimum 2 people, maximum 20 people. Reservation at least 24h in advance. A delicious exploration. Fun, great food and wine and a few eurekas guaranteed. Option afternoon self guide St Emilion if coming from Bordeaux. The half day tour is a combination of the Discovery Tour and the Revelation Lunch. This half day includes 2 pocket guides to wine in pdf. You will discover the vineyards and wine-growing and see biodiversity at work as well as taste classic organic wines of the region and natural no sulfite added certified organic and biodynamic wines. 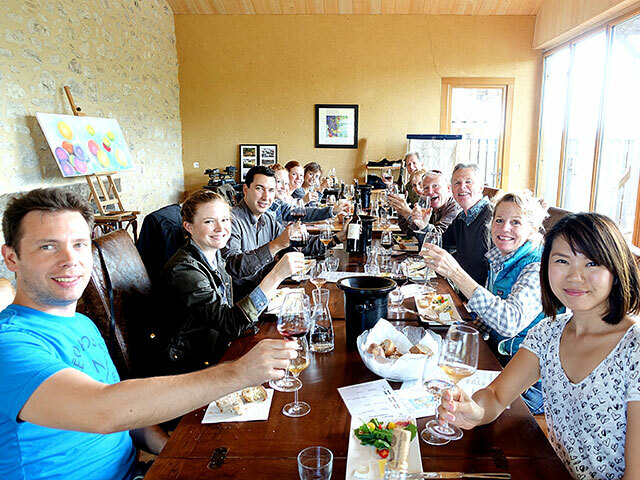 The wine and food pairing lunch is an opportunity to discuss the principles of wine and food pairing and to experience these principles in practice and have some fun. We can provide vegetarian and vegan friendly pairings and can cater to special needs like gluten free - please advise us in advance. All our wines are vegan friendly. It is possible to train direct from Bordeaux city, Sarlat or Bergerac or any of the stations in between Bordeaux and Sarlat to our local station Gardonne where we offer collection and drop off. This tour is available everyday (except Sunday). Two pocket guides in pdf including ready reckoners to help you recognise varietals, age of wine and well-known appellations and wine and food pairing. A two hour introduction to wine-making and its effects on wine including tasting of four wines that offer the opportunity to understand wine-making's effect on the wine. Includes a tour of the winery and a step by step walk through the wine-making process. Minimum booking 2. For all our tours please wear shoes that are good for walking outside as we spend some of the time in the vineyard. 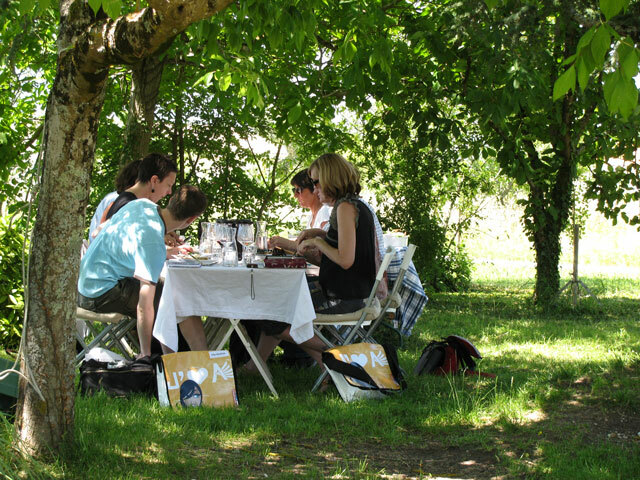 All our activities are held at Feely organic vineyard in South West France, 1 hour 15 mins from Bordeaux city, 10 mins from Ste Foy La Grande, 15 mins from Bergerac and 50 mins from Libourne TGV station. For access to the area, see contact page. We offer pick up and drop off from our local SNCF station for half and full day activities. Experience our beautiful ecological wine school and tasting room made of natural materials including wood, stone, chalk and hemp. 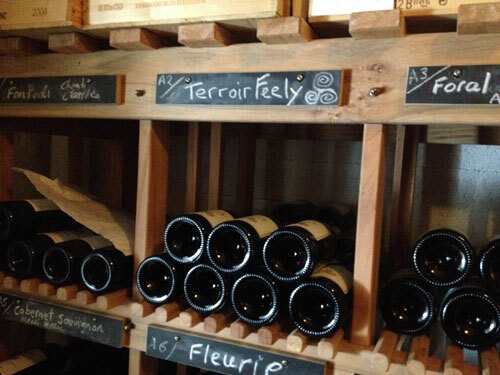 Chateau Feely tours have a certificate of Excellence on tripadvisor as does our wine school French Wine Adventures wine school and multi day tours in Bordeaux and Bergerac .